Because I don’t choose a lot of science fiction for independent reading choices I probably would not have ever taken this book off the shelf if it hadn’t been a Lovelace nominee this year. I am so glad I did! I thoroughly enjoyed this read. The main character is Ty, a teenage boy whose parents are “settlers” in Benthic Territory–a new settlement IN the ocean. The time is somewhere in the distant future when much of the East Coast of the United States has fallen into the Ocean. Those who live on land are crowded into narrow skyscrapers with tiny rooms. Your status in society is now determined by how much space you have. As a result, people like Ty’s parents have begun farming in the ocean as well as building homes and farms beneath the water. The ocean has become a Frontier similar to the original westward expansion in the United States in the 19th Century. The world below the water which Kat Falls has created is fantastic in its details. It is utterly believeable–as is all good science fiction. Ty was born subsea and has what is referred to as a “Dark Gift.” His particular gift is being able to ‘see’ with an internal sonar, allowing him to navigate spaces that have no light (real or manufactured). Some see the “Dark Gift” phenomenon in children born subsea as an abnormality caused by the increased water pressure on their young brains below the surface of the water. Consequently, the young people who DO have these special abilities hide them, afraid of others’ reactions and of government intervention in the form of experimentation, etc. Ty’s narrative inhales the reader from the first page as he unexpectedly discovers what appears to be the remains of a brutal attack by outlaws who have been plaguing Benthic Territory. He then meets Gemma, a girl his own age and a “Topsider,” who has come to Benthic Territory looking for her older brother. In searching for Gemma’s brother, the two teens encounter the menacing band of outlaws threatening the settlement. They discover the complicated web of cruelty and betrayal responsible for their existence of both the outlaws and their frightening leader, Shade. The strength of Ty’s story is that of all well-written science fiction: (1) it creates a believeable alternate existence which challenges the reader with wonder in both a practical and an awe-filled sense; and (2) Ty’s inner reality–his dreams, his fears, his goals–are universally accessible to all readers. 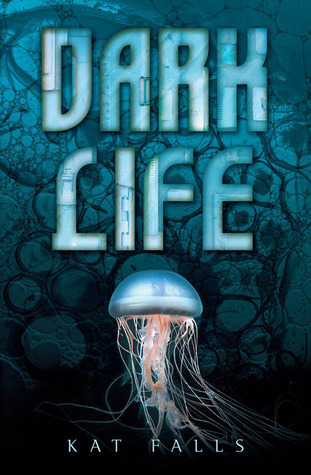 For those who like science fiction and those like me who tend not to seek it out, I highly recommend Dark Life as one of your Lovelace Nominee choices this year!